Cherry peach pie is my all time, hands down, no questions asked, very favorite variety of pie. Growing up I loved cherry pie the most – the kind made with canned cherries that are so sweet, tart, and a vibrant shade of red that it’s a little unsettling (there’s just no way they can have an ounce of nutritional value). 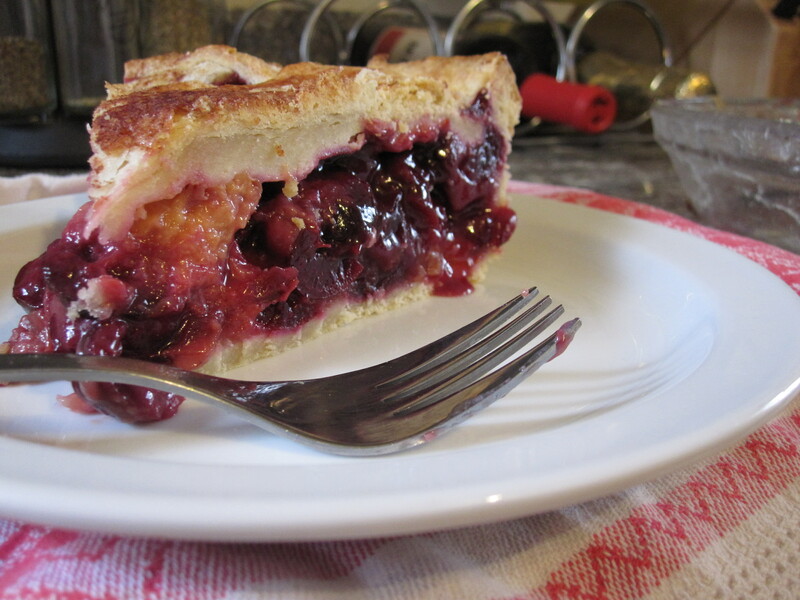 It wasn’t until last summer that I ventured into making a cherry pie with fresh cherries. Consider this pie an ode to the cherry. 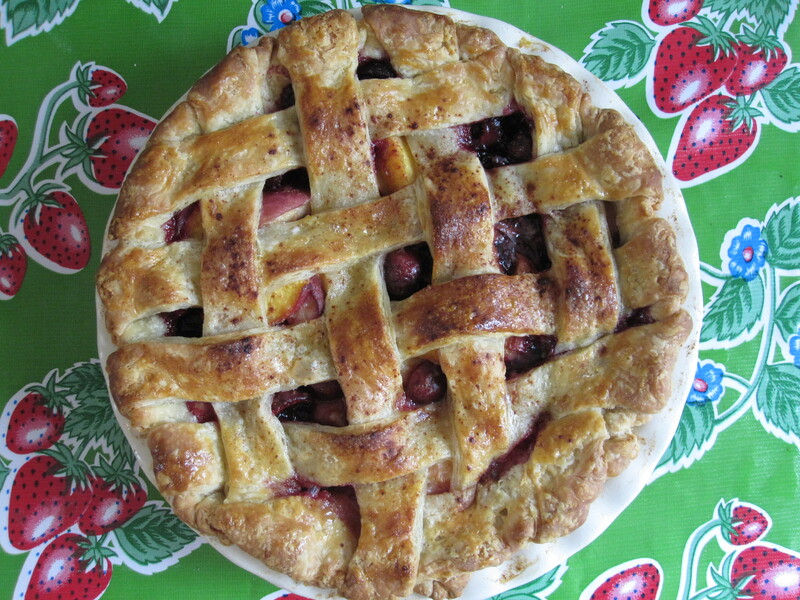 I made my first cherry peach pie of the season a couple of weeks ago as a special order for a friend. It pained me to see it leave my house without being able to eat a slice first, but considering that I am looking to get more and more into the business of selling my pies, I should probably get used to this reality. I baked and sold the pie on a Sunday. 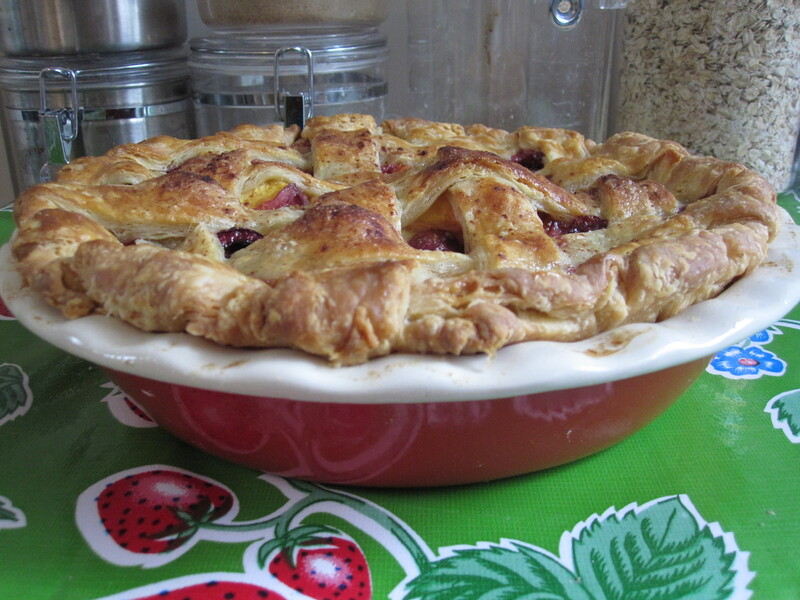 On Wednesday I was back at the farmers’ market purchasing a couple pounds of ripe, delicious, tempting cherries, and the following Sunday I baked a cherry peach pie that didn’t last 24 hours. Cherry Peach Pie Round II was a vegan version, and remarkably tasty with a crust so flaky it left me questioning for a moment whether I had accidentally used real butter (the vegan eating the pie with me would not have been too happy had that been the case). The combination of peach and cherry provides not only a color palette that is reminiscent of a desert sunset, but also a flavor that is so complimentary it leaves me wondering why cherry peach is not as popular a combination as, say, strawberry rhubarb. It’s like I’ve discovered some kind of top secret pie pairing that only the culinarily-adventurous are worthy enough to uncover. It’s not fair that the season for peaches and cherries is so short lived. It’s really a cruel trick of nature to only make cherries available for a few fleeting weeks out of the year, and peaches not much better. I suppose it’s a gentle reminder from the gods of the stone fruits that we should be thankful for all of the sweetest things in life, and enjoy them while they last – whether those things are people to love, places to go, or fruits to make pie with. A slice from the vegan version. Seriously, look at the flakes in that (non-butter) crust!! 4-5 ripe peaches (yellow work best in my opinion), cut into thin slices (you can peel them or leave the skins on, depending on your preference). If peaches are particularly juicy, you can place them in a strainer, toss with sugar, and let some of the excess juice drain out (helps prevent a runny pie). Place a baking sheet on the 2nd to lowest rack of the oven and preheat to 400°F. On a well-floured surface, roll half of pie dough into a 12-inch circle and carefully transfer to a 9-inch pie dish (a good trick: fold it gently into quarters, to transfer it more easily, then unfold it in the pie plate), Leave about a half an inch of overhang. Place in freezer. 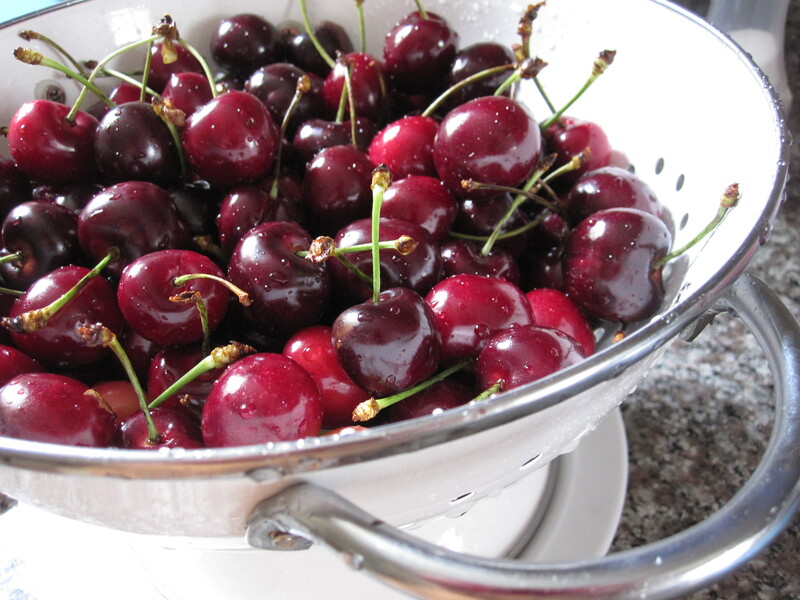 Combine cherries and peaches in a large bowl. Add sugars, salt, cinnamon, vanilla extract, and tapioca and stir gently until well-blended and you don’t see any white powder. Remove chilled pie dish/crust from freezer and brush the bottom and sides with egg (skip this step for the vegan version). Carefully pour in cherry-peach mixture, mounding slightly at the center. Roll out top half of dough and cut into 1 1/2 thick strips. 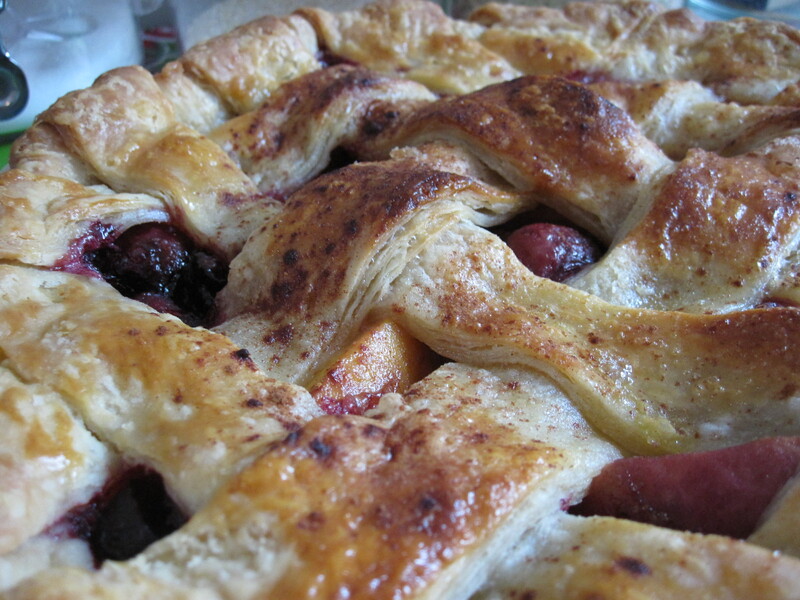 Place strips gently across the pie, creating a lattice-top. I generally do all the strips in one direction first and then go back the other way, lifting and alternating over and under to create the weaved look. Trim any overhang back to about an inch. Press and fold the top layer of crust under the bottom layer, and press firmly into the side of the pie dish. Using your thumb and forefinger of one hand and forefinger of the other, pinch the crust together around the perimeter of the pie dish. Brush top crust with either egg or almond/soy milk and sprinkle a little cinnamon and sugar on top. Place the pie on the baking sheet in the oven and bake for about 45-55 minutes, until crust is deep golden and juices are bubbling. Let cool on a wire rack at least 2-3 hours before serving. This entry was posted in Pie, Vegan and tagged cherry, peach, pie, vegan. Bookmark the permalink.